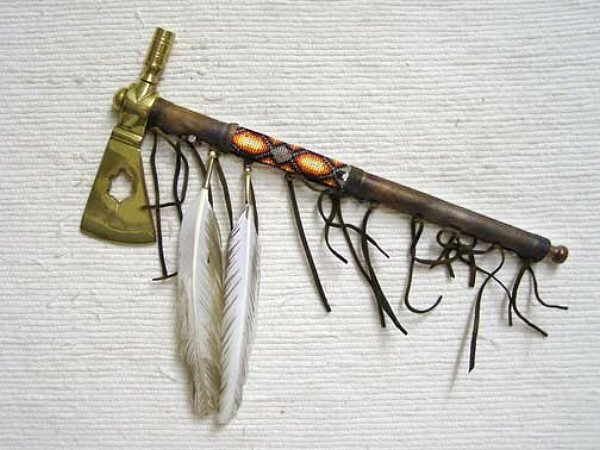 This woodland Indian style BRASS SMOKERHAWK with TURTLE CUT OUT is a combination tomahawk & peace pipe. Yes, it smokes ! 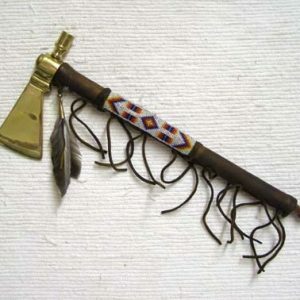 It has a genuine wood handle/stem that has been wrapped in atiqued genuine buckskin leather which gives it the appearance of being very old. Some intricate seed bead work adorns one side with a vibrant, traditional pattern. Bead work pattern & colors may vary slightly. It is finished with fringe & feathers. Feathers may also vary. 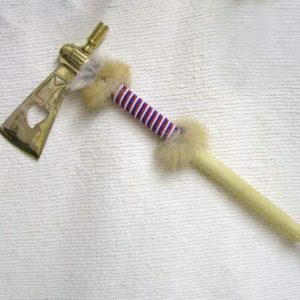 It has an 19th century style cast brass tomahawk blade with smoker pipe bowl & a cut out shape of a turtle on the blade. 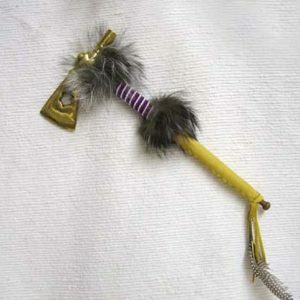 This one is 16″ long and the blade / bowl is 6-3/4″ wide.